Know before you go and identify the best pass for your plans. Find information on required federal, state and county licenses, passes and permits for parks and recreational areas or activities. Select passes and permits are available for purchase at the Eugene, Cascades & Coast Adventure Center in Springfield, Oregon. United States Department of Agriculture (USDA) Forest Service/Pacific Northwest Region. This website lists recreation sites that require passes, explanations of pass types and fees, and the option to purchase online. Includes the Federal Interagency Passes, Oregon Pacific Coast Passport and the Recreation Passes (day and annual). There may be a pass or day-use fee required for parks in the Siuslaw National Forest, Umpqua National Forest and the Willamette National Forest. Fourth graders may be interested in the Every Kid in a Park program. Seniors may be interested in the Lifetime passes. This website lists which Oregon State Parks require passes and where passes may be purchased. Look here for ATV permits. This website provides information on fishing, shellfish and hunting licenses. Online purchase available. Oregon Department of Motor Vehicles (DMV). Explains the Sno-Park Permit, where it is applicable, fees and how to purchase. They also offer snowmobile permits. 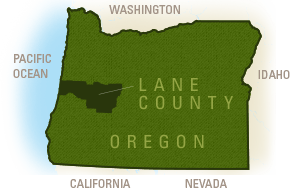 This website provides Lane County information including parking passes, special use permits and marina information. Lane County Parks Permit (available at the Adventure Center). A list of Lane County Parks requiring permits and the ability to purchase online. This pass provides access to 61 Lane County Park sites that require a daily access fee. A 50-percent discount is available to those 62 or older when they present identification. This pass provides access to day-use areas within the Oregon State Parks system. An annual pass is available for $30 and a two-year pass may be purchased for $50. This permit allows ATV access to public land that is designated for ATV use. It is valid for two years. Permits are available in four classes. A Sno-Park permit must be displayed in the windshield of vehicles parked in designated Winter Recreation Areas located in 100 spots across the state, including most ski, snowmobile and snow-play areas. This multi-agency passport provides one-year entry into 17 state and federal fee sites along the Oregon Coast. A 5-day version of the pass may be purchased for $10 or an annual pass is available for $35. The pass includes access to areas managed by the U.S. Forest Service, National Parks Service, Bureau of Land Management and the Oregon Parks and Recreation Department. This pass provides one-year access to all US Forest Service day-use fee sites in national forests throughout Oregon and Washington. This pass provides one-day access to all US Forest Service day-use fee sites in national forests throughout Oregon and Washington. Christmas Tree permits allow the removal of one tree under 12 feet tall from National Forest land. There is a limit of five tree permits per household. The Adventure Center is also a TicketsWest outlet, offers complimentary regional maps and visitor information. Visit us daily from 9 a.m. - 6 p.m. at 3312 Gateway Street in Springfield, Oregon, right off Interstate 5. Or contact our Adventure Specialists at 541.484.5307 for additional assistance.